Kazaa and Grokster (Fasttrack P2P Network programs) suffer from a number of performance limiters. The biggest problem is most files fail to download for a number of reasons. If you don't get your file within 20 minutes, you probably won't at all. Cheetah addresses those weaknesses and improves the efficiency of the downloads ensuring more files are received in less time. 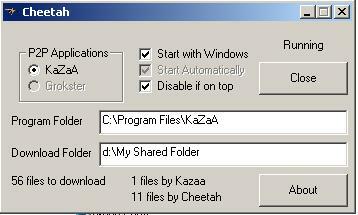 Cheetah will improve your download efficiency by ensuring that Kazaa or Grokster is always actively searching for files to download and that you always have downloads in progress if possible. Typically, users see a 3 to 10 times improvement in the number of files download. This can particularly benefit overnight dialup downloaders or any high speed connection (DSL and cable modem). Contrary to other network accelerators, Cheetah will not make your connection run any faster! On loading Cheetah, you won't see any immediate benefit however, leave it running and check the results the following day. The benefits should become clear.